Chakli is deep fried snacks made with the mixture of lentil flour or you can say made from gram flour, rice flour and wheat flour. 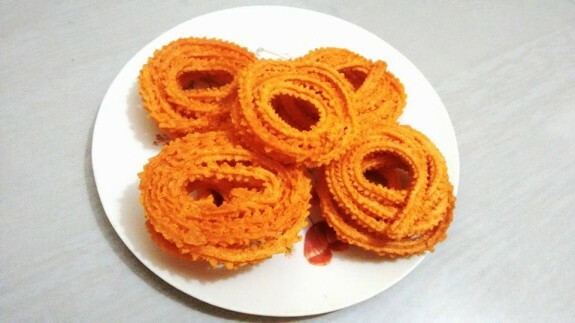 Chakli is also known as Murukku in some part of India. It is a big part of Diwali Faraal in Gujarat, Maharastra as well as in North India too. 1. Take a bowl and add rice flour and gram flour on it. 2. Add cumin seeds, sesame seeds, carom seeds, turmeric powder, asafoetida, red chilli powder and salt. Mix everything well. 3. Now heat oil or butter in a small pan. Add this hot oil or butter in the flour mixture. 4. Now, mix the oil with your finger tips with flours. Remember that oil is hot, so you need to be little careful. 5. Heat water in another pan till it starts boiling. Add this hot water to flour part by part. Mix with a spoon. 6. Add more hot water if required and begin kneading to form dough. Make dough which is firm. 7. Now, cover the dough and let the dough rest for 30 mins. 8. Apply some water in the chakli maker and place some portion of dough inside it. 9. Tighten the lid and press the chakli maker to prepare the chakli. Move it round to get a spiral shape. Make the Murukku or Chaklis on a butter paper so that it could be easy to remove. The dough needs to have enough moisture otherwise the chaklis may break while forming them. 10. Now heat enough oil on a pan for deep frying. 11. Lift the chakli gently from the butter paper and slid into the hot oil. Fry 3 to 4 chaklis at a time. 12. Check the first batch of chakli. If chakli is breaking in oil, then add some rice flour on the dough and knead again. 13. Again make chaklis with remaining dough on butter paper. Fry the chaklis till they golden brown in colour. 14. Fry the rest of the batches of chaklis in a same way. Once the chaklis will get cool at room temperature, and then store them in airtight box or jar. 15. You can serve them normal or as a snack time recipe with tea or coffee.